Combine the black beans, chicken sausage, roasted red peppers, cumin, paprika and garlic powder in a 10-inch skillet. Stir well. Pour the water over and stir to combine. Cook the black bean mixture over medium heat for about 10 minutes, stirring occasionally and pressing down to crush the black beans, until the water is evaporated. The mixture should be almost creamy when its done. Meanwhile, heat the shells according to package directions. 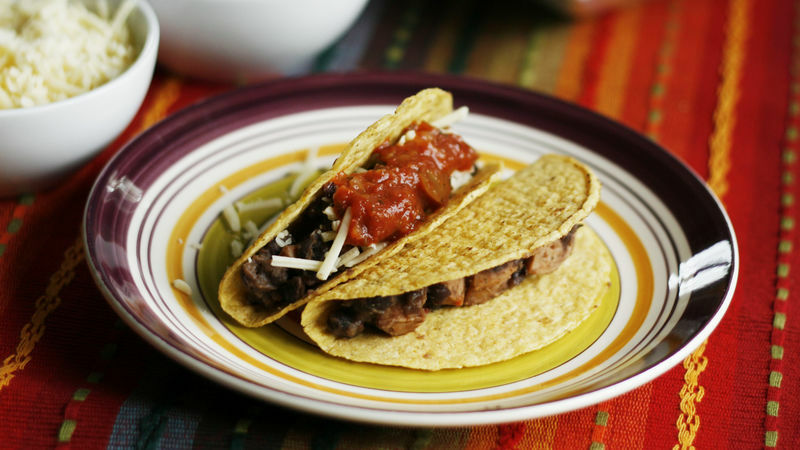 To serve: divide the black bean mixture evenly among the taco shells. Serve with bowls of cheddar and salsa. Enjoy. When you hear tacos, what image pops up? Maybe the classic ground beef version piled high with lettuce, tomato, salsa and cheese? Or maybe a chicken version, encapsulated in a soft tortilla? Or is it the newer favorite fish tacos? Chances are, these Black Bean and Sausage Tacos aren’t what you see … but if you give them a try you just might. The black beans are seasoned with cumin, paprika and garlic powder and crushed slightly as they cook in a bit of water. As a result, it becomes somewhat of a black bean sauce that envelopes the bits of chicken sausage throughout. All in all, making the filling takes about 10 minutes. The black bean and sausage filling is spooned into crunchy taco shells and served with a bit of shredded cheddar and a spoonful of salsa – however hot you like it. What I love about these tacos is the mild but flavorful filling. It’s meaty and filling, but not overpowering. The sharp cheddar and cool salsa create layers of flavor that are just irresistible. My three-year-old ate three of these babies in a sitting … and she’s usually a one taco kind of gal. If you wanted to make the filling spicy though, it’s easy. Choose smoked paprika, which will give it a great smokiness, and then double the cumin. Add a chile powder, such as chipotle powder or cayenne pepper, a little at a time until it’s to your desired heat. You could also pile on some chopped hot peppers to the final taco too. If you really want to step up the heat, that is. But I’ll stick with these kid-friendly mild ones, thanks. That’s just how I roll these days. More ideas for you taco fans! Do you like your tacos mild or fiery?